Way back in January I had $1.00 off 1 Rozoni pasta coupons and they went on sale at Nob Hill for $0.99 making them free. 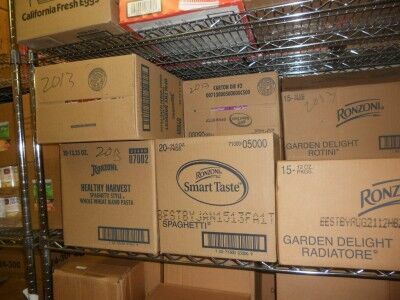 While I bought quite a few boxes of the pasta at that time, I didn’t want to run out their stores entirely, so I left plenty of extra boxes so others could take advantage of the sale. I had plenty of extra coupons and there weren’t enough boxes even after visiting all the Nob Hill stores in my area to use all of them up. I decided to ask one of the managers at a local Nob Hill if he would be willing to order extra boxes so that I could use the extra coupons I had and get the pasta for free. The manager was more than willing to help out, but because the sale was only one week long, he didn’t think that the order would come in before the sale ended. I explained what I tried to do to Karen who works at the Milpitas Food Pantry and apologized for not being able to get more boxes for her. She called up a Nob Hill manager she knew and explained the situation. Nob Hill was courteous enough to say they would extend the $.99 price for the pasta and sell it to us as long as the coupons didn’t expire. Since there were still a couple months left before the coupons expired, we didn’t think that there would be any issue at all. We asked Nob Hill to order us 1000 boxes of the pasta. About a month later, we received a call saying that a manager from Rozoni wanted to talk to us. We called to find out that the manager wanted to see the coupons we were planning to use. We scanned the coupon and sent it to the manager and received a reply that she never had seen these coupons and implied that we were counterfeiting them. Since she didn’t believe the coupons were real, she refused to sell the pasta to us. Although greatly disappointed (and a bit offended of being accused of something we were most definitely not doing), I know these things happen from time to time while couponing and I thought that was the end of it. Karen had other ideas. She wrote a letter to upper management at Rozoni basically saying that if they didn’t want to sell pasta to us, then simply say that, but don’t use as an excuse that coupons that their company clearly distributed were not real to get out of selling the pasta. 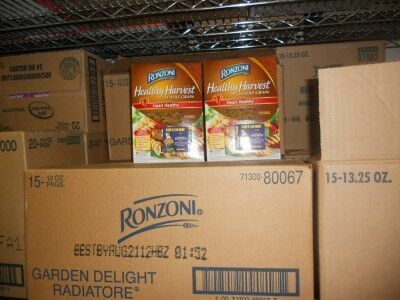 It took some time to work through the system, but eventually Karen received a phone call from a vice-president at Rozoni apologizing and saying that they were more than willing to accept the coupons. The only issue was that the coupons had already expired by that time. To their credit, Rozoni said they would honor the spirit of the coupons and send the Milpitas Food Bank 1000 boxes of pasta for free. 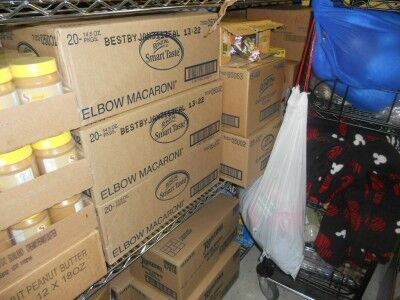 Although it took awhile, we were able to secure $2290.00 worth of food for free. Readers and I have now donated over $53,000 worth of food to local food banks. If you would like to participate, it would be great to have you join. Not only will you be able to help provide needed food to your local food pantry, you will learn to save quite a bit of money on your own grocery shopping. This entry was posted in Penny Experiment. Bookmark the permalink. I’m very glad it worked out for you. Great job Karen and Jeff. Persistance sometimes does pay off. That is awesome! And Ronzoni’s upper management gets kudos for turning around a bad customer service experience. Has the pantry considered writing letters directly to local food manufactures and grocery stores to ask for any food surplus? Walmart was notorious for throwing food out…I think they have started a campaign to change their ways. I sent you information on Dominicks (Safeway) in the Chicago area letting food expire on the shelf and selling it instead of donating it to the local pantries. No pantry will except expired food. Also, I have just recently tried my hand at couponing to see if I can do it. I posted the results of our first attempt on my blog. Eh. Not so good. But I’m learning. Maybe when I get better, I can help out with the couponing efforts for PEP. That is awesome. While watching the Extreme Couponing show, I was thinking it would be great to get free food for food pantries. Tell me how did you get 1000 for anything? Just found this site. I’m awed and inspired by the donations you and your readers have made. It really does make a difference and I’m just really impressed with all the hard work you put in!! Way to go! I just took advantage of a sale of this pasta at a Kroger near me today. I’ll be donating 40 boxes of it to my local food bank. Enjoyed reading your sites! Keep up the good work. Milpitas Food Pantry is now working with Target through Second Harvest Food Bank. We receive both perishables and non-perishables. Many of the perishables are now being picked up and distributed on a daily basis through Second Harvest but there is still much food going to waste! Thanks to all of you who coupon and share with your local agencies who serve the needy instead of proudly hoarding ten years worth of toothbrushes!! !